The ETOILE Gold Wedding Crown is an absolute head-turner. 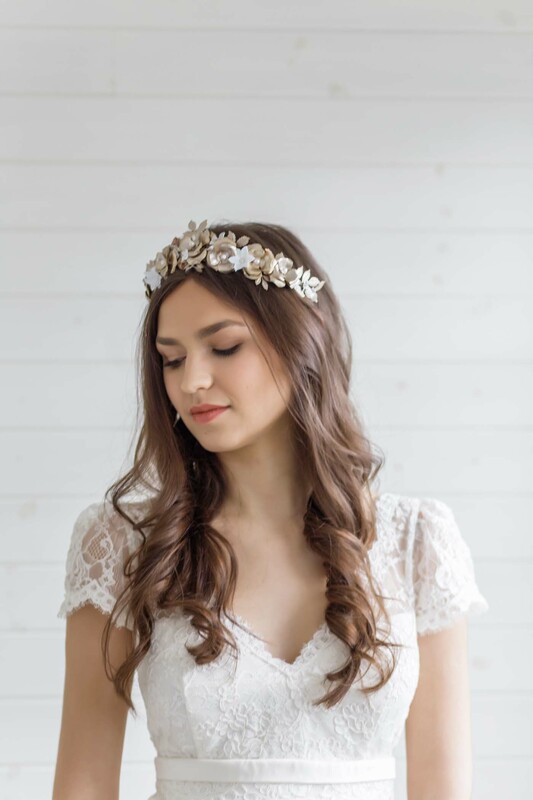 For the bride who really knows what she wants, looking for a beautiful, botanical alternative to a wedding crown, the Etoile Gold Wedding Crown is simply perfection. 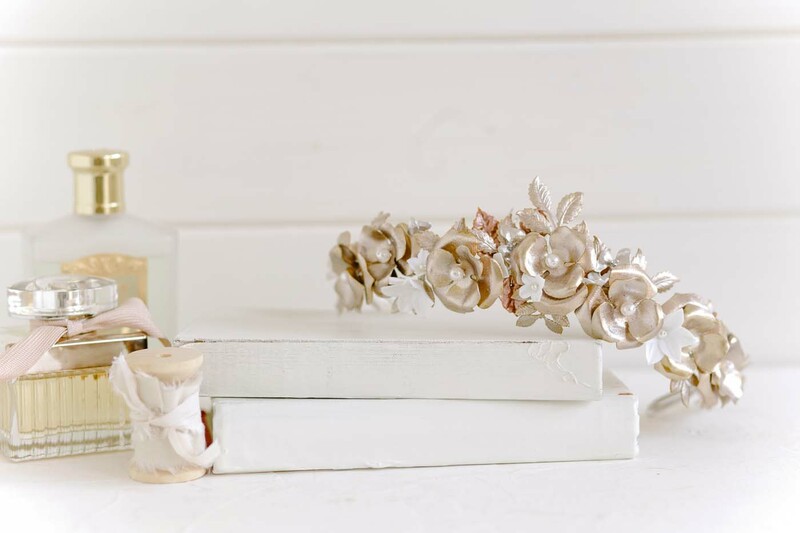 Multi-sectioned gilded roses with pearl centres are mixed with hand formed clay flowers in various sizes, smaller gold flowers, clay leaves, sprays of crystals and freshwater pearls. The whole piece is set on 3 separate combs to ensure a secure fit, and ribbons can also be added to the ends to tie at the back – please add a comment on ordering if you would like ribbons. The Etoile Gold Wedding Crown is available in Gold/Bronze as shown, all gold or in silver. The Rose Gold Bridal Halo (also available in silver) is the epitome of delicate bridal beauty. Round, freshwater pearls in blush pink are carefully handwired onto the halo using rose gold plated wire, along with tiny ivory freshwater pearls and sparkly Swarovski crystals. 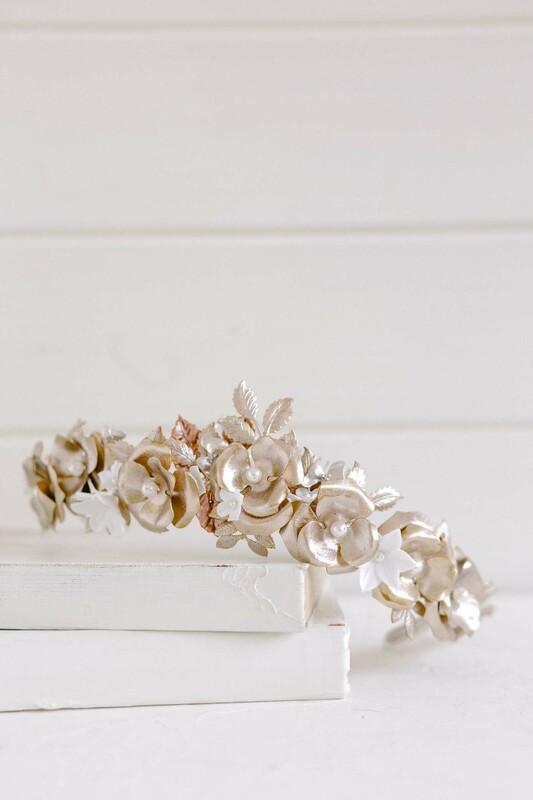 A gorgeous adornment of mother of pearl flowers and twinkling rhinestone branches sits to the side of the head on a silver plated comb to fix the Rose Gold Bridal Halo into the hair. At the back, lovely long trails of satin ribbon finish the crown allowing for a self-tie fit. 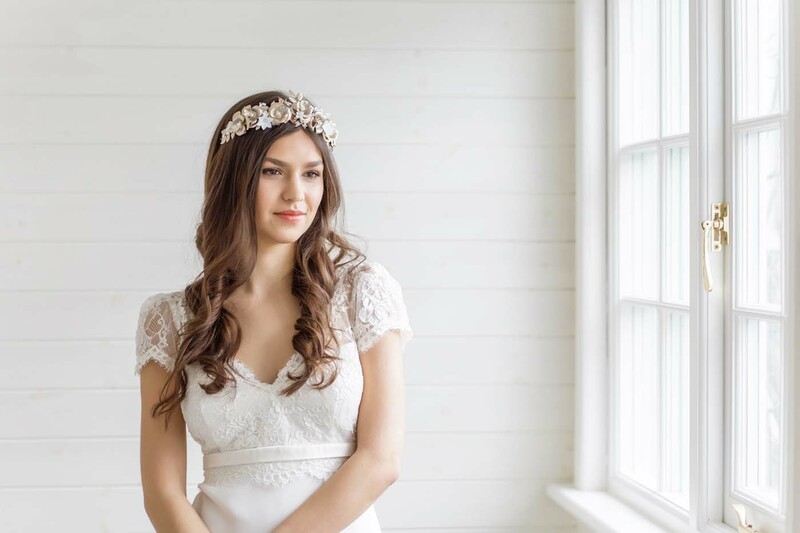 As it is a flexible piece, the Rose Gold Bridal Halo can be worn across the brow for a Boho Bride, higher up as a crown, or even at the back around a beautiful up-do. Available in blush/rose gold or ivory/silver. 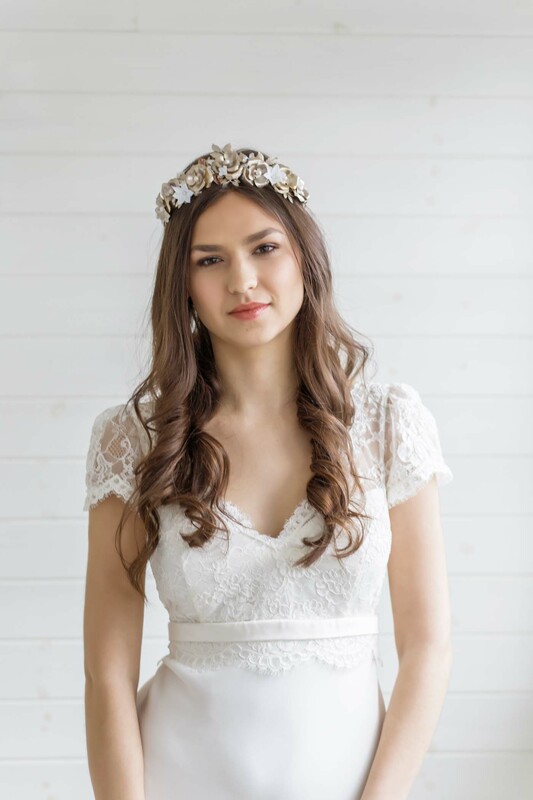 A beautiful Art Deco inspired forehead band strung with ivory swarovski pearls and attached two statement rhinestone adornments on each side (backed with our beautifully soft, signature suede), set with small silver-plated combs to slip effortlessly into your hair.